Ganda, Ali (Aloysius), Sierra Leonean calypso singer and composer; b. Serabu, Sierra Leone, 1927; d. Freetown, Oct. 28, 1964. Although born in the provinces, “West Africa’s Calypso King” received most of his education at St. Edward’s Secondary School and Forah Bay College in the capital, Freetown. After college Ganda returned home to teach at a Catholic mission school run by his father. Upon hearing his first calypso records in 1949, Ganda was struck by the essential Africanness of the style that had developed in the Caribbean. He then began writing his own calypso songs, the first of which was “Poor Little Monkey,” to bring the music back to what he felt was its true home. In 1956, on a Sierra Leone scholarship, Ganda studied broadcasting and drama at the Rose Bruford Training College in the U.K. He signed with the U.K. label Melodisc to record “Poor Little Monkey” and several other sides including “Give Me Back My Rice” (a commentary on English cooking), accompanied by resident musicians from West Africa and the West Indies. Songs in honor of the queen, “The Queen Visits Nigeria” and “Welcome to Our Queen,” earned the greatest notoriety for the singer, who began calling himself “Lord” Ganda. 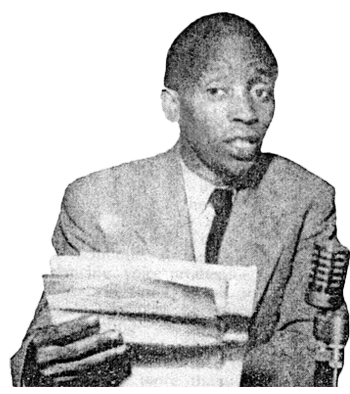 Returning to Sierra Leone shortly after independence in 1961, Ganda worked as a program officer for the Sierra Leone Broadcasting Service. He moved to television with its introduction in 1962 and rose to the position of acting head of programming. Throughout his broadcasting career Ganda continued to write, record (in the studios of SLBS), and perform his calypso songs. Most, like “President Tubman,” “Nigeria is a Republic,” and “Free Trade,” were composed in honor of important people or events. Ganda was known to be a heavy drinker who ignored doctors’ advice to quit. His hospitalization and subsequent death at age 37 likely attributable to his alcohol consumption. He is remembered as a popular regional star whose music presented a snapshot of the times in English-speaking West Africa. Sierra Leone Music: West African Gramophone Records Recorded at Freetown in the 50s and Early 60s (Zensor ZS 41) 1988. “West Africa’s Calypso King,” West African Review (May 1956); G. Stewart, “The Music of Sierra Leone,” The Beat (vol. 12, no. 1, 1993).